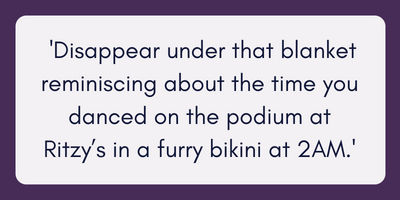 I was going at a million miles an hour with a full time job, a six year old whirl-wind child, studying for a PhD, running half-marathons, socialising with friends and family, not to mention a long-suffering partner…..well you get the picture, I was pretty busy. Weekends were packed with beach trips, walking, writing and all the other things that a woman in her prime (40 cough something) gets up to. Then there it was, an innocuous little lump and all of a sudden my life was hospital waiting rooms, needles and a lot, and I mean a lot, of lying down. 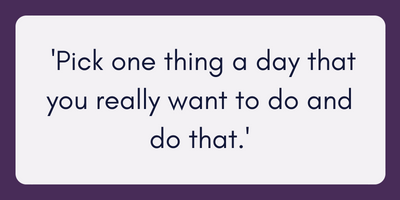 One of the hardest parts of the last year and a half has been feeling too tired to do 10,000 things a day because of the fatigue that comes with having cancer and having the treatment for cancer – for me surgery followed by chemotherapy, radiotherapy and herceptin. After my treatment finished all my friends and family wanted to celebrate because they thought it was over. But the fatigue hung around and to my astonishment I was not ready to get back to my hectic schedule the moment the last radiographer wished me well. So for what it’s worth here’s my top three tips for coping with fatigue whilst you’re waiting for it to lift and get on with your life. You want to run in the morning, lunch with your mum, take the little darlings to the park and when they are safely in bed swish down to the local wine bar for a few cocktails with the girls? Think again. Pick one thing a day that you really want to do and do that. Getting out and about is essential to beating fatigue, as is gentle exercise (I totally recommend yoga) but you can’t do everything and if you try to then you’ll be wretched for the next week. You’ve gotta love a plan. When you’ve picked that one thing you want to do: plan it. How long will it take to get there? Is there lots of walking involved? Who will give you a hand should you suddenly need to lay down in the middle of the street for a snooze? Spontaneity is the friend of the fit. Fatigue means that you may need to think a bit about how you’ll manage your daily activity. And while you’re at it get a lovely pair of pjs too. There is no shame in snuggling down under a blanket on the sofa in your pjs at 6pm. Fatigue is the sort of tired that a nice afternoon nap isn’t going to cure, but accepting you will need to rest is part of the package. So I say embrace it, invest in a blanket that is going to make you feel safe and loved (try the National Trust recycled wool blanket – awesomely comfy and good for the environment) and disappear under that blanket reminiscing about the time you danced on the podium at Ritzy’s in a furry bikini at 2am. There will be a time when you’re up there again, but in the meantime tuck up, listen to your body, and have a nice cup of tea. 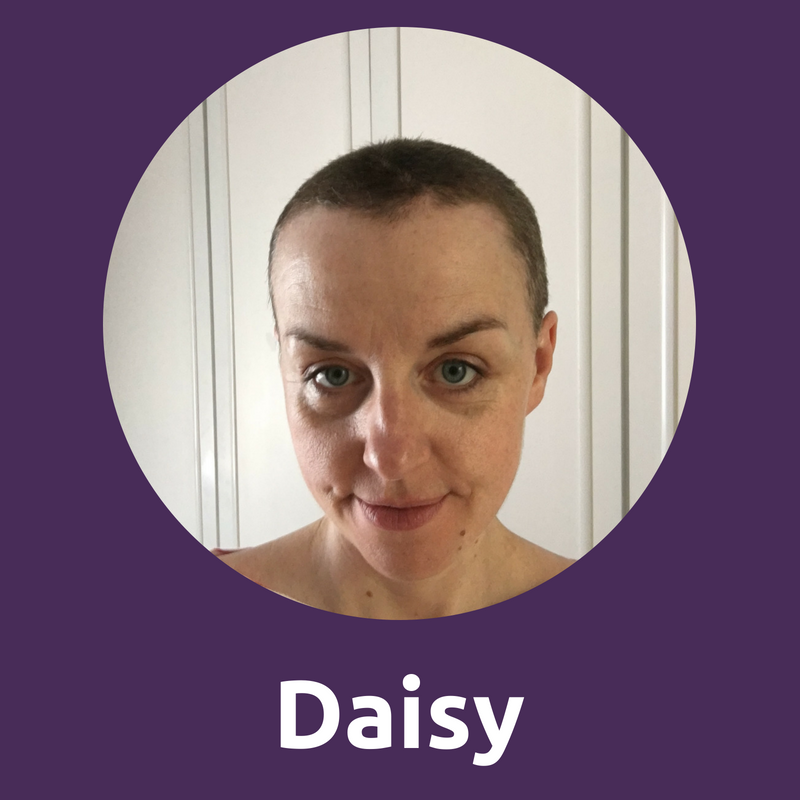 Daisy is a working and running mum in her 40s from Wales, and a breast cancer survivor. I was just telling my son that I’m run down and exhausted and I need to take a time out and rest or I’m going to get sick.I’ve been cancer free for over 6years I had small bowel cancer.My digestion is definitely affected and because I don’t absorb nutrients properly fatigue is part of my life and I accept that.I was always very active my whole life until cancer.I accept that I’m getting older and cancer definitely weakened me I only wish others would be more understanding.Some people just don’t understand they try to make you feel guilty about listening and your body like you’re doing something wrong.That bothers me and irritates me I guess the only people who can relate are those that have been there’s biggest challenge has been not to care what others think. What a fabulous description of real life after cancer! Thank you for this!! Keep strong. Totally agree. Some of best advice I had was from a friend who had been Chair of one of the main Breast Cancer charities. She said "when you get home, leave the shopping in the kitchen and go and lie down. You can put it away later. I can so relate to all of that. My problem was I was trying to live up to other people’s expectations of how I should feel after being given the all clear. I was making myself worse - a chat with my specialist nurse Jane put it into perspective for me. Prioritise things. Most people think you will just go back to normal after treatment has finished but it doesn’t work like that. Still having problems 18 months into remission. To me the definition of post cancer fatigue is :- you don’t want to do what you normally really love doing. - You just can’t be bothered.